Cano played first base and batted in the No. 2 spot for Tuesday's game at Oakland. He picked up a single in the third inning. 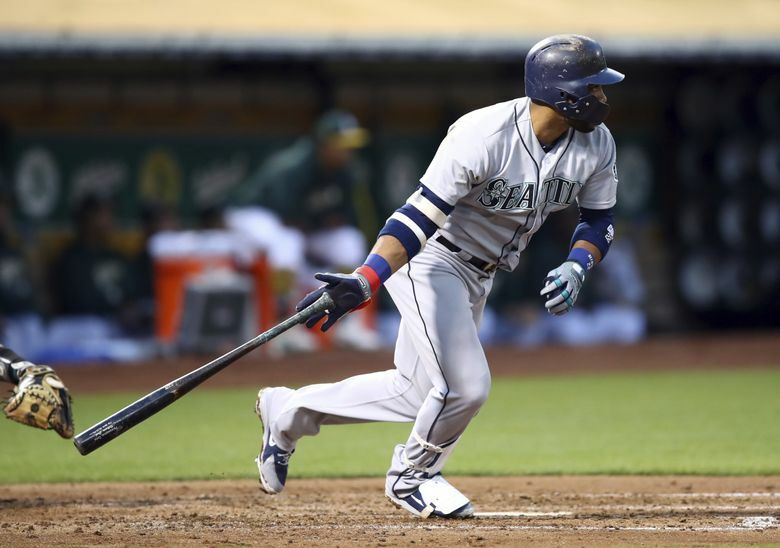 OAKLAND, Calif. — Robinson Cano didn’t pause from his answer when he saw the familiar faces walk into the cramped room of the Oakland Coliseum. But when he finished, he broke into that wide familiar grin. All of the Mariners’ position players had assembled behind the media there for Cano’s pregame press conference on the day he was reinstated from an 80-game suspension for violating Major League Baseball’s joint drug testing policy. The sound of large humans moving in a pack and some of them taking seats in old folding chairs interrupted the quiet of the room as Cano spoke. Any discussion from baseball pundits and fans that somehow Cano might disrupt the clubhouse chemistry was nonsense to them. Asked about the group of players watching, Cano looked at them before answering. The Mariners were battling for the postseason in his absence, something that wasn’t lost on him. Cano’s first game back was an eventful one. He was immediately inserted into the starting lineup at first base and was batting second. Cano went 1 for 4 with a single. This night would be his first professional game at first base, while he was batting in a spot other than his customary No. 3 spot in the order. And none of that mattered to him because he was just happy to return from baseball purgatory. Cano will need to be ready for anything because there is no set plan for how to use him. Manager Scott Servais, who has tired of talking about Cano’s possible usage, reiterated that again before Tuesday’s game. As part of Cano’s return, Dee Gordon, who has been starting at second in his place, will also return to playing some games in center field. First baseman Ryon Healy was the first of the regular starters to lose playing time to Cano. He stands to lose the most in Cano’s return, but Gordon, Kyle Seager and possibly Cameron Maybin could all be affected. How does Servais plan to manage that aspect? Cano never seems to let much bother him and shrugged off the difficulties of playing first base. Cano was loudly booed in his first at-bat of the game by the sparse A’s crowd. He knew it was coming.